We hold expertise in offering Angular Diamond Plated Pins. These conical angle electroplated grinding pins are accurately made using the hardened tool steel. These pins are also manufactured using the high quality electrogrip process in order to ensure the even particle distribution on a grinding surface for the optimum cutting speed as well as tool life. We are dealing in Diamond Angle Pin. Catering to the increasing demands of our patrons, we are engaged in offering a premium quality range of Electroplated Diamond Grinding Pin. The provided range is available with us in diverse specifications. Our company has gained name and fame in presenting Electroplated Diamond Grinding Pin. Internal grinding pins are used for small diameter machining and high speed grinding. Diamonds are deposited in every possible shape, providing the internal grinding wheels with a wide range of capabilities even for applications such as internal grinding of carbide dies wear parts. 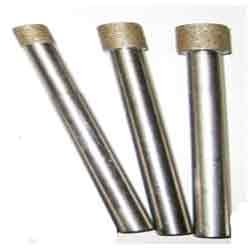 Our offered Internal Grinding CBN Pins are made from a solitary piece of steel and are toughened for supreme rigidity to best fulfill your application need. These pins are easily available at nominal price rate. Our range of Electroplated Diamond/CBN Internal Grinding Pins is widely used in high speed grinding and small diameter machining. These diamonds/cbn are deposited in all types of shapes that provides the internal grinding wheels a whole range of capabilities. 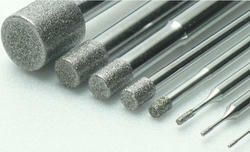 We offer a wide array of Electroplated Diamond Grinding Pins that have an exceptional cutting and grinding life. They are mainly used for Jig & Internal Grinding of small holes in material like Ceramic, Glass, Carbide, etc.